Quit treating your weed trimmer like a sewing machine! Stop wasting your time trying to thread spools of nylon through your weed trimmer! There is now a safer and easier way to trim weeds. The Weed Thrasher is an all steel head with 12 quick change cutters. With the included mounting hardware and easy to install instructions, the Weed Thrasher will fit effortlessly on any weed trimmer. The removable nylon pad, on which the trimmer can be rested, lets you glide along sidewalks or driveways to obtain a smooth and even cut every time. 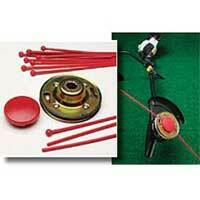 With no more nylon spools to become tangled or jammed, the Weed Thrasher will save you time, money and your sanity! As seen on TV Fits on any size gas weed trimmer. Durable nylon cutters cut the tallest weeds away! Nylon cutters maximize your weed trimmer!